It doesn’t seem possible does it? Already 2 weeks into January, almost halfway though the month! But what a mild week it has been, the grass seems to be growing, certainly put on a bit of growth in the weeks between my visit to one site, hoping we get a little bit of colder weather to slow it down! One thing I hate is those winter days where it’s just dull all day, makes me feel very inclosed and we had a week of those, only day it was bright and cheerful was on Wednesday when I had the pleasure of taking a pruning workshop for a small group at Waterperrys in Oxford, the gardens there are always wonderful and it was lovely taking time to spend basically talking about a job I love doing, pruning roses. Taking about pruning let’s delve into my sin on Saturday for this week, again coming from a clients garden in the new forest. 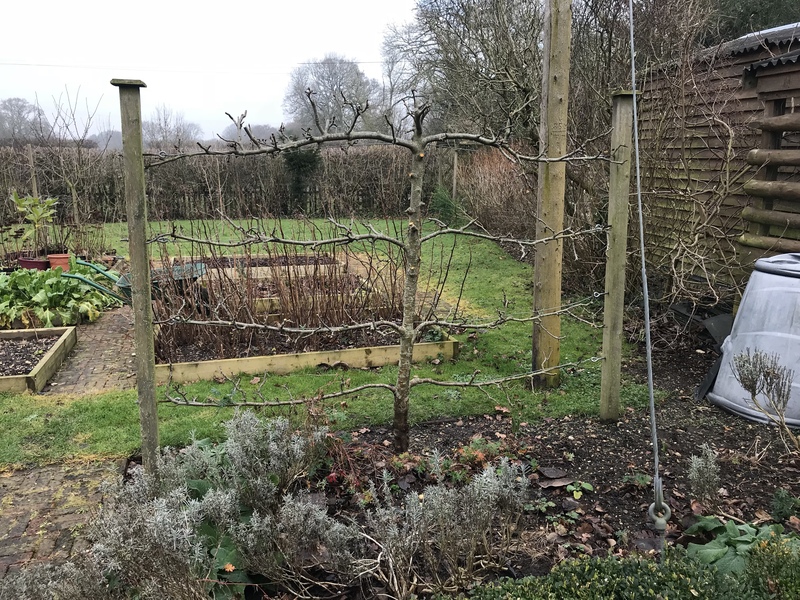 First one of the 6 this week has to be pruning these beautiful espalier apple trees, not had much pruning done for a few years, had to do a little corrective works on them to get them into a little more of a shape but very happy for the finished works, will be summer pruning them next time. Rosemary and I am guessing this form is Miss Jessop upright, well the straight upright stems are a little bit of a giveaway! One plant we never think about using as a wall shrub, it makes a great espalier if grown on a sunny wall or 6ft fence panel! Takes a few years to get there, but well worth it, sorry got lost on another line of thought! Yes flowering remarkably early this year. I just had to add this Sarcococca into the mix, the smell from its tiny white flowers just filled the whole garden with its scent, again without the planting plan, the size of the shrub along with the leave shape leads me to believe its hookeriana var Humilis. Great for a small garden and the scent is just out of the world! Previous post: Pruning cuts-how to get them right! Part 1. I much prefer our winters – seeing our garden so dry is heartbreaking – some of it looks as though it could be desert! Hip, hip hooray! Spring’s approaching. Having a wander this week, I realised that, finally, I have no unseasonal blooms in the garden. No sign of budding on the roses here yet but they’ll get their final tidy-up this week as per your pruning instructions 🙂 . My hallway-located Sarcocca sprig is doing a fine job inside. Corrr you are lucky fella, so many out of season blooms down here, have you had it really cold with you over the past few weeks? Ahh good luck I hope it goes well with the roses, I love pruning them. Is live good with you up in Wales John? Been a bad winter(warm and bone dry) here. So yes, we could do with some winter chill! Thank you for that excellent photo of the espaliered apple tree. Am training one, and it is good to have something to aspire too. How old do you reckon those trees are? Thank you 😀 hopefully will be featuring them a little more over the next 12 months as they improve 😀, I think they are about 15yrs old, the garden was designed and laid out about 10 years and they must of been pretty mature when planted, Is that a normalise winter for you? How long have you been training yours for John? Your client’s garden looks wonderfully inhabitable. And now I know the difference between espaliered & fan trained. I’ve see the latter but didn’t realise it was different. Also am intrigued by the idea of rosemary as a wall shrub. Will you do anything interesting w/all those rose hips or simply lop them off? Oh, I so dislike espaliers. No matter how much work someone puts into each one, no one afterward knows how to care for it. There are three evergreen pears and six Southern magnolias espaliered at Saint John’s. They have been hedged for years and look really bad now. As if hedging was not bad enough, they were not hedged back enough, so three of the magnolias are now encroaching into walkways. Or the way they are not looked after. I think that they would be nice for fruit trees in small gardens, but few people stay in the same home long enough to appreciate all the work that goes into espaliers. By the time the trees are really producing nicely, it it time to relocate. I think the espalier apple trees are so pretty, but maybe that’s because I don’t have any, and they aren’t very common here. It’s hard to beat espaliered trees for sheer elegance. Fascinating. I love the look of old, espaliered trees but haven’t tried it myself. I had no idea that rosemary could be espaliered. It grows very fast in our climate, so perhaps a good choice for experimenting? Or would fast growth mean too much work pruning? Cool. Project for next Spring. Miss Jessop doesn’t seem to be grown around here–maybe not hardy. The common cultivars are Arp, which is upright, and Salem, which is a bit more sprawly.